One day, Josh and I will be homeowners. Alas, that time is not now and so we have to find ways to adjust to life as apartment renters. Sometimes though, it can be so hard to make adjustments when you're renting. For all of you who are also renters - especially those of you who, like us, don't have freedom to change many things - I'm sure you understand the frustration that comes along with renting. Don't like the carpet? Too bad. Don't like the kitchen floor faux marble tile? Learn to live with it. Wish your countertops weren't ugly renter's white? You just have to adjust. 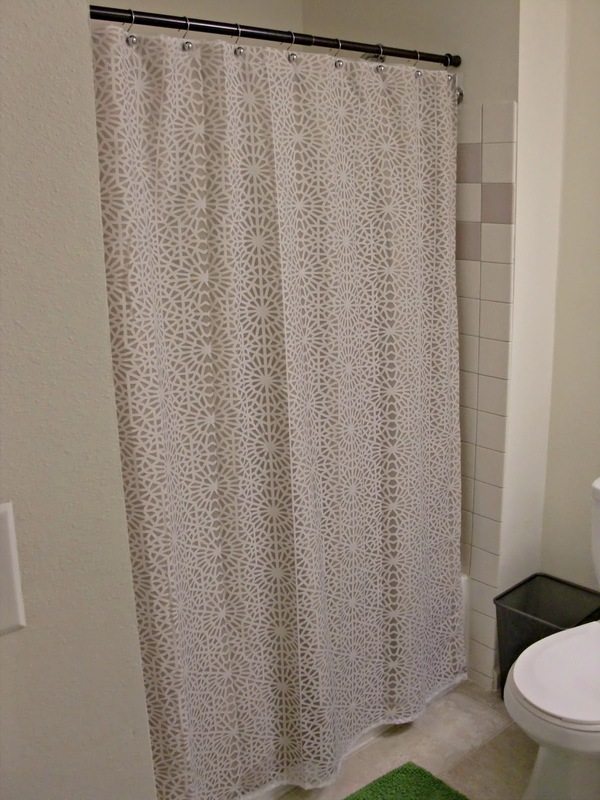 Don't understand why the shower curtain bar in your master bathroom is set lower than in your guest bath? Good, neither do I, and so I found a way for you to fix it. For whatever strange reason, there is one less row of tile in our master bathroom shower than in our guest bathroom shower - making it so that in our master bathroom, the shower curtain was touching the floor on the outside of the shower, like you see above, and so that the liner was constantly being stepped on in the inside of the shower. It didn't take very long for me to get really tired of this situation and so I decided to take matters into my own hands. It's a good thing we live so close to Walmart. Enter into the picture our $6.99 shower curtain rod. This is a tension bar so you don't need to worry about screwing things into the walls or unscrewing old fixtures. Simply open up, extend, push up against the wall, and twist into place. Okay, for the record, these directions were a little more confusing than they seem and there may have been a few moments where Josh and I thought that this idea was turning out to be a terrible one and I was going to have to return the shower bar to Walmart. But then we figured it out! And now, we have a beautifully working, perfectly placed at the correct height, shower curtain bar! Seriously, it was that easy. And now we're obsessed. You can barely even tell there's another shower curtain bar there - and it's been up for over a month now with no problems. We are officially thrilled with the fix we created for this issue! Are you an apartment renter who is frustrated? What quick fixes have you used to fix things that are bothering you? Are you as ready to stop renting as I am? Our shower is thankfully a door because I HATE, HATE messing with shower curtains! 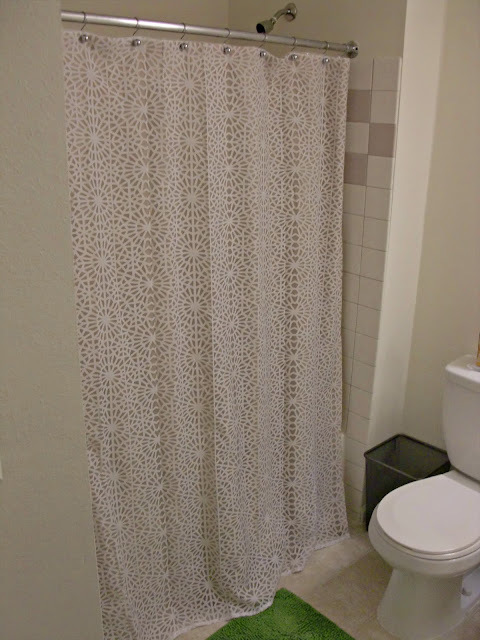 I don't know if it is because I grew up with shower doors or what but long shower curtains and them just in general drives me insane. In my next home - which hopefully we will own - I am all about a shower door! They're just easier to deal with in general - I completely agree with you!